DataNumen Zip Repair (DZIPR) (formerly Advanced Zip Repair) is a powerful tool to repair corrupted Zip and Self Extracting(SFX) files. It can scan the Zip archives and recover your data in them as much as possible, so to minimize the loss in file corruption. Main features: 1. Can fix all sub-types of Zip files and all kinds of self-extracting files. 2. Check data integrity and fix incorrect CRC values in the archive. 3. Support to repair Zip files and Zip item files larger than 4GB. 4. Support to repair spanned Zip files, split Zip files and encrypted Zip files. 5. Support to repair Zip files on corrupted medias, such as floppy disks, Zip disks, CDROMs, etc. 6. Support to repair a batch of files. 7. Support to find and select the Zip files to be repaired on the client computer. 8. Support to extract recovered items in the fixed Zip or SFX archive. 9. Integrated with Windows shell, so you can repair a file with context menu in the Explorer easily. 10. Support drag & drop operation. 11. Support command line parameters. Changes: - Improve the user interface. - Fix some bugs. Press release: DataNumen Zip Repair 2.5 has been released! DataNumen Inc., a world leader in data recovery technologies, announces DataNumen Zip Repair 2.5. 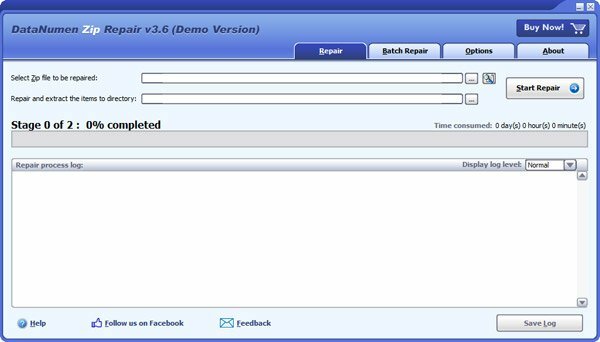 This application lets anyone repair corrupt Zip archives with remarkable ease. DataNumen Zip Repair Demo Version License DataNumen Zip Repair Copyright © 2001 - 2018 by DataNumen, Inc. All rights reserved. This demo version license applies to the demo version of DataNumen Zip Repair. If you have purchased a full version of DataNumen Zip Repair, please refer to DataNumen Zip Repair Full Version License in this help document.